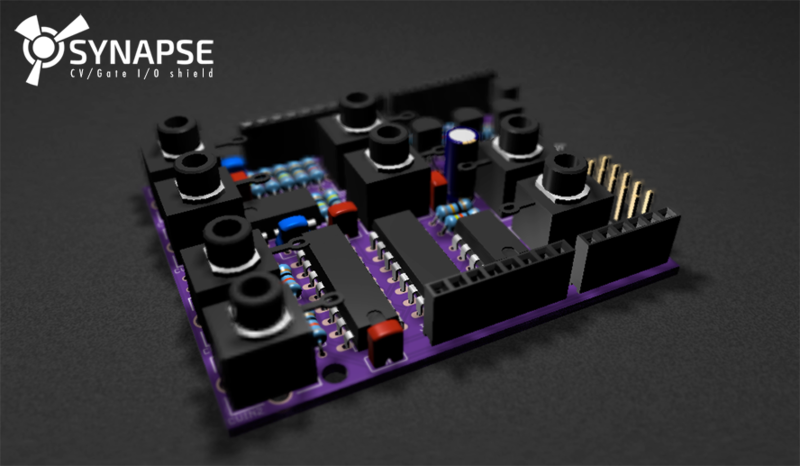 Synapse is an Arduino shield (and the corresponding library) which provides CV and Gate I/O for Arduino boards. The shield should work fine with any Arduino with onboard 5V regulator which can tolerate up to 12V on the VIN pin (e.g. it will NOT work with an Arduino Yùn or Tian and will most likely damage the board). The library can be installed using Arduino Library Manager (Sketch -> Include Library -> Library Manager), just search for "synapse". Optionally, you can configure a callback function for each gate input channel which will be called when a specific condition is met.